Harness the powers of air, earth, fire, and water to bring your elementally inclined character to life with Blood of the Elements! Whether you are the progeny of genies and wield a portion of their elemental wish magic or seek to glean some of the awesome arcana of the Elemental Planes for yourself, this Player Companion is the definitive guide to playing a Pathfinder RPG character with mastery over one or more of the four elements of creation. Blood of the Elements provides a player-focused, in-depth exploration of the geniekin races and the Elemental Planes. In addition, each Pathfinder Player Companion includes new options and tools for every Pathfinder RPG player. New details for the five geniekin races—fiery ifrits, curious sylphs, hardened oreads, fluid undines, and elementally balanced sulis. Tons of new race and regional traits, allowing you to customize your geniekin character for his or her heritage and situation. A whole bazaar of new magical and mundane equipment to help you traverse the Elemental Planes in safety and style. A bold new teamwork feat that allows you and your allies to combine elemental spells to achieve powerful new effects. New rules options designed specifically for geniekin and elementally themed characters, including spells, rage totems, mutated bloodlines, a cavalier order, and more! This book makes me furious and almost makes me feel a little teary-eyed at the wasted potential. I am a huge fan of Blood of Angels/Fiends, and how they both spend 32 pages on expanding a single race. As a result, Angels/Fiends are the gold standard of a racial supplement. After Angels/Fiends, pretty much all my aasimar/tiefling needs were catered to. They had tons of subraces, so no matter what ability modifiers I wanted to have, I was covered. They had feats. They had traits. They had magic items. They had variant abilities. And of course tons of fluff and art. Then I open Blood of Elements. I flip to my favorite of the elemental races, sylph. Three traits and two spells and 1.5 pages of fluff text. I just want to cry. I want to cry. There was so much that could have been done for the elemental races. So much. Instead, of the 32 pages, a bare 10 pages is split among five races (the four geniekin plus suli). So two pages for each race, and of those two pages well over half is fluff, so you have less than one page of crunch per race. You look at the five pages of tiefling subraces in Blood of Fiends PLUS ALL ELSE in that book. Then you look at less than a page for ALL CRUNCH PER RACE in this book. It is a completely insane design choice to spend 10 pages of this book on describing the four elemental planes plus the City of Brass, when there was WAY TOO LITTLE space for racial crunch already, and then they waste space on planes! As much space is spent on planes as on the races! When the races are already page-starved!! They never should have tried to cram FIVE different races into a single 32 page book to start with. But if they absolutely insisted on that terrible choice, then the ABSOLUTE MINIMUM starting point from there would have been to jettison absolutely everything else. No two-page planar map. No ten-page planar descriptions. No two-page "elemental magic". No two-page "magic items". Just the races. Nothing else. Absolutely nothing else. The 32 interior pages should have been allocated as follows: 6 pages per race, and the leftover 2 pages to editorial content like table of contents and rules index. 6 pages per race would have been the barest minimum to even get started on covering the races. What they did now -- 2 pages per race, and more than 1 page of that is fluff, less than a page is crunch per race -- is insane. It's ludicrous. It's insulting to people who actually want to play these races and want options. How could they possibly have thought that people who want to play a sylph would find more value in a two-page planar map than in getting two more pages of traits or subraces? What is wrong with them? This is the single worst designed Paizo product that I can off-hand think of. I wish I could give it less than one star. The only people I can recommend this to are people who actually don't care about playing the geniekin races. I'm baffled and flabbergasted at whoever designed this product. 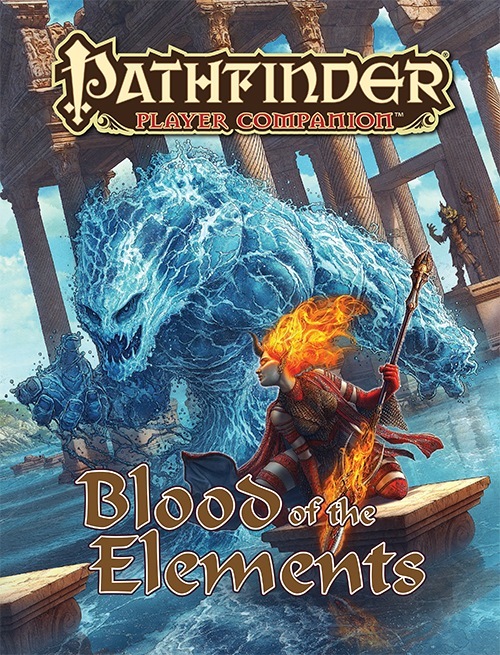 Blood of the Elements, a 32-page entry in Pathfinder's Player Companion line, focuses on a collection of races that are pretty new to me even though I've been playing RPGs for a couple of decades now. "Geniekin" are five different races in Golarion descended (as their name implies) from genie and human blood, and each has strong ties to particular elemental forces. Ifrits are passionate and impetuous humanoids with links to elemental fire, Oreads are strong and stoic creatures linked to elemental stone, Sylphs are slight and willowy people linked to the element of air, Undines are the cold but perceptive links to the element of water, and Suli are . . . well, I'm not quite sure. They're kind of the odd race out, and even after reading the book I still didn't get a good read on exactly how/why they relate to the other four beyond having genie ancestry and (I guess) a balance of the four other elements. I'll get into the details in a second, but as a quick overview I'll say that 1) I think the artwork and layout for this book is fantastic--it has a very cool, unearthly feel that fits the theme perfectly; 2) The book has (to me) a good balance of flavour text and rules mechanics, but readers expecting character options covering every single page will be a bit disappointed. The gorgeous cover speaks for itself. The inside front cover concisely summarizes the racial traits of each of the five races. It's good to have them here, as otherwise a player would have to find them online in an unofficial source or get the hardcover Advanced Races Guide where they first appear. Next up are three pages that you'll probably skim over quickly (a table of contents, an index of new rules options, and an admittedly more useful "For Your Character" page that tells you what classes the book focuses on). Usually the inside back-cover of books in this line just reprint the cover art, but here its devoted to a table listing spells with elemental descriptors from hardcover sourcebooks; it's a really nice way to help find spells for a geniekin PC that fits their theme. The book proper starts with a two-page introduction that talks about the origins of the geniekin races. It also has a terminology section--usually I find these unnecessary, but as I'm pretty unfamiliar with this whole area, I found it surprisingly useful. Each of the five races then gets a two-page overview, with the first page consisting of description and lore and the second page presenting new player options that include at least a couple of race and regional traits in addition to something else. The traits are interesting and original, without being so awesome that they become mandatory. Many of the new player options are thematically-linked to the race, but broad enough that PCs of other races could take them as well. * The section on Ifrits introduces a new cavalier order: The Order of the Flame (an order devoted to members achieving personal glory). It sounds really fun as a role-playing choice, with some potentially crazy results in big combats. * The section on Oreads introduces the idea of "gem magic," which allows them to modify (usually in a pretty minor way) the effects of spells by adding a valuable gem as a material component. It's an interesting idea, but frankly pretty weak in most cases considering the cost. I think it's a system that would require a full elaboration somewhere, not just a one-column entry. * The section on Suli introduces the concept of Elemental Totems for barbarians, with the rage powers granted depending on the particular element the barbarian is devoted to. I'm not an expert on barbarian rage powers, but some of them at least sound pretty cool, like an Earth element one that would likely result in enemy weapons shattering against their skin. * In the Sylph section, two new arcane spells appear: "Enshroud Thoughts" and "Storm Step," the latter of which sounds really fun (the PC turns into a lightning bolt and can zap opponents in order to change positions on the battlefield). *The Undine section introduces two new bloodlines for the "Wildblooded" sorcerer archetype in Ultimate Magic. One of the bloodlines has to do with elemental water (of course), while the other is tied to Marid ancestry. The granted powers are pretty high-level, and I'm not familiar enough with the norm for sorcerers to say how desirable they'd be. Thematically, they're interesting at least. Each section has an "On Golarion" sidebar that discusses (geographically) where the race might be concentrated, and I thought this was great for integrating character backgrounds. The middle of the book is a two-page map titled "The Inner Sphere of the Great Beyond." It's done in the style of an in-game artist's rendering of how the different planes relate to each other. I think it's pretty cool and would be something I'd use in a game to explain the relation of planes to players. Next up is a series of two-page entries on each of the four elemental planes. The first page describes the plane and what adventures might be like there, while the second page introduces some new equipment and regional traits. Apart from the description of the Plane of Earth (which was a lot of name-dropping with very little information), I thought these were nice (if necessarily cursory) overviews of the planes. Most of the magical items and traits didn't really stand out to me, but two did: first, a "Planar Alchemical Catalyst" piece of equipment that modifies normal alchemical items in some really interesting ways to (in part) make them more useful at higher levels; second, a "Thoughtful Wish-Maker" regional trait for the Plane of Fire that allows a character to (probably) avoid having their wishes corrupted--it's probably a trait that would have no effect for about 85% of a character's adventuring, but could then turn out to be really useful near the end! The remainder of the book is something of a miscellany, with each section consisting of a two-page entry on a different topic. There's an overview of the City of Brass (a scary place!) that would be useful to GMs; it also introduces a couple of new magical items and regional traits. An entry titled "Elemental Magic" introduces a new teamwork feat that creates a new secondary effect when two elemental spells are combined into one; it's an interesting idea, but as with all teamwork feats, it requires just the right PCs in an adventuring group in order to make it worthwhile. The section also contains a really cool picture of an Undine spellcaster and a sidebar on how other areas of Golarion conceive of the elements--an idea worth developing if areas like Minkai or Vudra ever get dedicated sourcebooks. Last, there's a section simply titled "Magic Items." My conclusion is that, for what they do, they're way too expensive. I suppose they could make an interesting quest item or dungeon loot, however. Overall, I really liked Blood of the Elements as a colourful and evocative introduction to the genie-kin. I've heard some grumbling from other readers that it didn't contain enough "crunch," but to me it had a nice balance. When I consider playing one of the races, it'll be the first place I turn. I liked the Blood of the Elements book more than I would expect, especially with the reviews I saw on the site. Indeed it lacked the crunchy part we're used to in the Blood books, but on the other side it presents a very good background for the characters. Blood of the Elements looks at the geniekin races (ifrits, oreads, sulis, sylphs, and undines), providing background and character options for each. It also goes beyond this and looks at the four elemental planes, as well as the famed City of Brass on the Plane of Fire—and this is part of where the book goes wrong. There have been a number of Blood of... books and the best ones (Blood of Angels, Blood of Fiends) have had tight focuses, while the weaker ones (Blood of the Night) have tried to do too much. Thirty-two pages really isn’t enough space to adequately cover five races and include a gazetteer of the elemental planes, making Blood of the Elements one of the ones that tries to do too much. I didnt like this book as i read it, but having read it a second time, its a solid 3-stars. The common complaint that it doesnt explore any one area in detail is valid, as is the question as to why material about the planes made it in at all. well the obvious answer is that it had to be available somewhere, and it wasnt enough material to get its own campaign setting. You get the races, optional race traits, new regular traits, a feat, magic items, material on the planes. you get a lot. And theres nothing wacky here, so its a solid 3 star book. they covered a TON of areas, just not a huge amount of material on each piece. Announced for June! Cover image is a mockup and subject to change. Cool! More fuel for my planescape fires! Five races? I guess ifrits, sylphs, oreads and undines are a given. Who's the fifth? Suli? Oh yeah! That´s long anticipated and hoped for! Please let this be a real good book! The ifrit and sylph feats so far are real state of the art where to go with new feats! Suli would indeed be the fifth geniekin race, since their forebears are the janni. I hope there are more "...of Golarion" books featuring "savage" races, though, like hobgoblins or whatnot. I was kind of hoping there would be "half-elementals" (as in similar to the half-elementals from the 3.0 Manual of the Planes) covered by Paizo one day but this book intrigues me anyway. I look forward to browsing this book in great length once it becomes available. I hope there are race options to give qualities of the non-standard elementals of Ice, Mud, Lightning, and Magma in place of the usual racial abilities of Undines, etc. Judging from the description, it looks like Blood of the Elements is going to reinforce ifrits, sylphs, undines, and oreads as inheritors of a geniekin legacy, so I'd imagine that's this is unlikely because there are no Ice, Mud, Lightning, or Magma geniekin races. Well, this is one I've been waiting for for a long time! Awesome! Looking forward to this one. I love the companions that expand our knowledge and options of current races. No, I know that. What I'm suggesting though would be some alternate racial traits for the existing geniekin races that would allow for those sorts of options. Magma Form: Geniekin with this trait gain either acid resistance 5 or fire resistance 5. This resistance does not stack with their existing resistance, but simply provides a second elemental defense. This racial trait replaces their racial spell-like ability. Prerequisite: Oread or Ifrit. Well, I already preordered it. I'm a little disappointed that it doesn't look like there's going to be variant versions, but in all honesty it's not that surprising considering the relative scarcity of monsters from the elemental planes...and the general unlikeliness of most of them to actually willingly participate in creating the various kinds of elemental planetouched in the traditional fashion, as it were (leaving room for nontraditional methods like planar contamination, wizards experimenting, etc.) Then again, shaitan are apparently made of metal, stone, and gems, so, I guess that's all relative? I do hope there's a sidebar that mentions a few possible non-genie ancestries at least...mephits, perhaps? Azer? Salamanders? More disturbingly, Tojanida, given their entry in Misfit Monsters Redeemed? Well, regardless, anything that generates or enables more character concepts is certainly worthwhile, so hope this has some fun feats for those whose ancestry has been tainted by the elemental planes, as well as some interesting spells. There's already an ifrit racial trait for Salamander ancestry, so we know that it's possible. I will say this, I kind of wish there was something for Fetchlings, they're kind of the odd ones out. Perhaps they'll be in some other book. Cthulhudrew: Yeah, something like that would be a nice possibility. What about the fifth element, Boron? Let's stop the real world politics discussion in the product thread, please. Move it to the Off Topic section if you want to continue the conversation. Thanks! What i also hope is that the elemental races can be a bit more human like, just like Aasimar and Tieflings. No necessarily flaming hair or other weird things. Janni would be my guess for the 5th bloodline. If they do touch on the non-standard elemental races- the ice, lightning, mud, and magma ones- it would be interesting to see them also addressed in a non-mechanical sense. Are they the "half-breeds" of the geniekin world, filling a niche like half-elves and half-orcs? Are they still considered full geniekin? Do they live in "para-elemental" ghettoes, or only on the outskirts of the planes where the elemental borders are? Or even, for that matter, what the differences between elemental bloodlines that we know of are. For instance, the fire salamander bloodline for Ifrits was mentioned upthread. We also know of racial traits deriving from mephits and azers (for ifrits), nereids and ooze mephits (undines), and mephits (oreads). Are they just considered the same as geniekin whose ancestry derives solely from their genie forebears? Or is there a hierarchy, perhaps a caste system? It would also be neat to see, as others have suggested, some traits that are different from either genies or elementals, but other sorts of elemental creatures, like a thoqqua or tojanida (which someone else mentioned). Also, probably out of the bounds of this product, but what about divs? These guys haven't gotten any love in quite some time; div-blooded geniekin could be the genie equivalent of tieflings. I can't wait for this one, I do love the books about races that are not about any of the core ones. Blood of Fiends already handled div-spawn tieflings, so I doubt there's going to be a planetouched equivalent. I was actually curious about something relatedly, like if celestials and fiends with elemental affinities could produce other kinds of planetouched; for example, the brijidine azata has the earth and fire subtypes in addition to the good and chaos subtypes, so I was wondering if their distant descendants might potentially be ifrits or oreads in addition to aasimar, but James Jacobs said nope, just aasimar, so doubt there would be a different kind for divs. I'd forgotten about that. Still, given they are formed from corrupted genies, I would think it a shame to not mention them in this product somehow. Azer are a neat elemental-touched race to draw some sort of heritage from, as well, and have a longer footprint in the game than genasi or oreads or whatever. Same with other elemental-type humanoid races, such as Pech and Tritons. I wish we had more elemental creatures for these guys to have interesting bloodline offshoots like the aassimar and tiefling books. But I am sure they will have something interesting in there. I hope we get a table of possible variant ability replacements for the spell-like ability of ifrits, oreads, sylphs, and undines like we did for aasimar and tieflings, and also a table of random possible features that reflect some of the possible heritages. I do agree it would be nice if the elemental planes had more creatures statted up for them, or at least elemental versions of the celestial/entropic/fiendish/resolute/shadow templates. That would be cool, I like those alternate list of abilities.